Yerevan is the historic capital of Armenia. With over 1 million residents, it is the largest city of the country. Yerevan offers you the opportunity to discover its rich culture, which includes art, music, drama and film. The top touristic attractions of this destination include Republic Square, Matenadaran, and the National Gallery of Armenia. Prepare yourself to explore this amazing metropolis, because cheap flights to Yerevan are now available for a limited time! Yerevan is the home of Zvartnots International Airport (EVN), which is a 15-minute drive from the city centre. 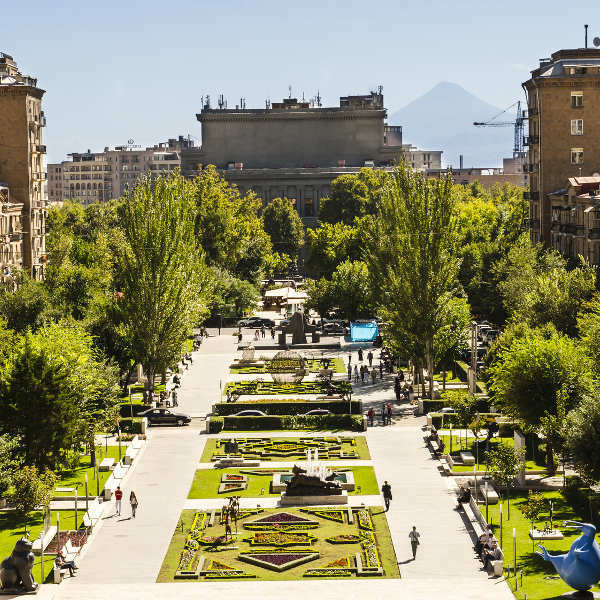 Treat your senses to the variety of lovely parks and gardens around the Armenian capital, including Tumanyan Park, the Botanical Garden and Victory Park. The huge selection of museums, theatres and concert venues will keep you entertained and informed. 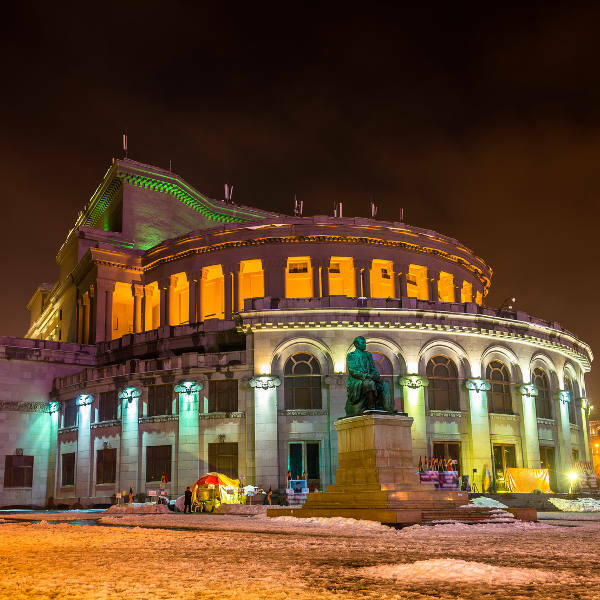 Some of the top venues include Komitas Museum and the Paronyan Musical Comedy Theatre. Foreign invasions and an earthquake in 1679 destroyed much of Yerevan’s historic monuments, however, you can still admire sites like the Zoravor Surp Astvatsatsin Church and the Red Bridge. The shoulder seasons of spring (April and May) and autumn (September and October) are the best times to visit, especially if you want to get lower hotel rates and shorter lines at tourist attractions. Added to that is the pleasant temperatures (low to high 20s). The summer (June – August) is definitely the most popular time to visit; with temperatures reaching the low 30s in the day and the mid-teens in the evening, guaranteeing cool nights. The influx of tourists reaches its peak during this season and hotel room prices will go up. Discover one of the oldest continuously-inhabited cities in the world! Yerevan is the capital of Armenia and its largest destination. This exceptional metropolis offers a unique scene, with an environment filled with old and contemporary buildings. Enjoy the pleasure of listening to live concerts and watching quality films and performances at the variety of theatres around Yerevan, such as the Nairi Cinema and the Yerevan Opera and Ballet Theatre. Visit the Saryan park, a popular venue for featuring the paintings of the local artists, while the Yerevan Vernissage open-air exhibition-market is home to traditional Armenian hand-made artworks. 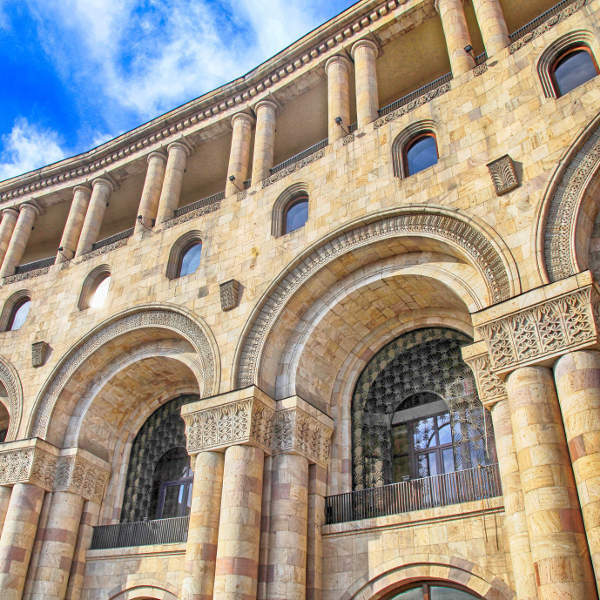 Find out about the city’s history with various museums and monuments, including the History Museum of Armenia and the Erebuni Fortress. Compare several airlines, and book your cheap flights toYerevan online at Travelstart! Watch out for traffic when crossing the road, as it can get extremely dangerous to do so in non-designated areas. There is also a fine of about ֏3000 for jaywalking. Beware of scams in the restaurants and nightclubs. In both venue types, at the end of your night, you could be presented with a bill that is higher than the total you ordered. With regards to the restaurants, ask for a specified bill and challenge any extras. In terms of the nightclubs and bars, beware of establishments that are almost empty. Palazzo di Lusso on Northern Avenue is one of these places that you should avoid. Furthermore, you should get up to date on all the routine vaccinations before your trip to Yerevan. Depending on your activities, you may also need vaccines for other diseases, such as hepatitis A, hepatitis B, and rabies.